Forging(Hada) : Jigane steel is a bit on darkish bluish side. Hada is well-kneaded Itame and small swirling grain marks of Mokume-hada appear on Hiraji side and Straight Masame appears on Shinogi-ji surface. Sparkling martensite crystals Ji-nie appears against well refined bluish Jigane to generate black gleaming lines of Chikei over the Hiraji surface. Temper(Hamon) : Hamon is a rather on stronger side martensite crystals Nie-based, starts with a gentle up-hill slope Yakidashi on base, wide undulating Notare with small head of Gunome. Boundary line glows with martensite crystals of Nie and deep in the Nioi-mist-like crystalline area where Gunome-feet of Nie splashes into the cutting edge, YOU dots appear and short lines of Nie-Sunagashi sparkles. Tang(Nakago) : UBU original. Yasurime is greatly slanting left Ō-sujikai. Back ridge of Nakago is flat with Ō-sujikai filemark. The heel shape is V-shape of KENGYO. The AOI crest 葵紋 carved at upper the Nakago in front and lower along Shinogi-suji there are 6 charactar of signature to read YASUTSUGU Motte Nanbantetsu 康継以南蛮鉄 and the other side is chiselled a place of work Bushu-Edo ni-oite kore-wo Tsukuru　於武州江戸作之. Here is a prominent work by the exclusive sword artisan of the Tokugawa Shogunate - YASUTSUGU 康継 the third generation in Bushu-Edo capital. Edo the 3 rd YASUTSUGU 康継, real name Umenosuke 右馬助 later changed his name to Ichi-no-jo 市之丞. After the death of his father - second generation YASUTSUGU 康継 in Shouho 3 (1646), a legitimate son of Ichi-no-jo 市之丞 at the tender age of 16 established Edo YASUTSUGU 康継 family in capital Edo under the guardianship of his uncle 康意康継. The Tokugawa Shogunate had bestowed AOI crest to YASUTUSU families both for Edo and Echizen like this example that resembles Horimono carving with decorative flavor. 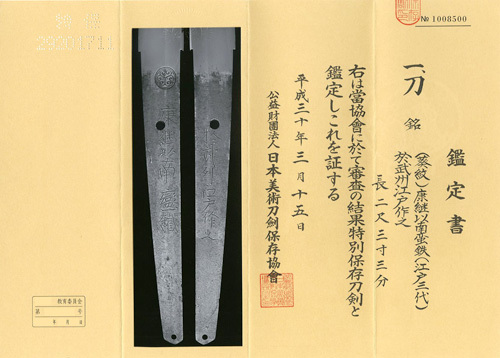 As generally known this katana was exclusively made for high class Samurai of the Tokugawa Shogun vassals or Fudai-daimyo feudal lord and came into vogue creating a sword to use an imported steel of those times called Nanbantetsu which was reportedly known as performing supreme sharp cutting result. This katana has been treasured by generations in peaceful Edo period impressively heavy on hands and Nakago glows an excellent taste of patina for 350 years history. The 3 rd Edo YASUTSUGU is comparatively not prolific as he died young at 48 years old in Enpo 4 (1676).